Clive’s been in and around the club for 7 years, since he brought his sons down to junior coaching in 2010 and, although he’s not been a playing member of the club until comparatively recently, he’s made full use of Melton Park’s facilities, appearing regularly with Matt and Alex to practise in the nets. After a couple of seasons playing for Cringleford, Clive turned out for the Sunday Friendly side and, following 2015’s AGM when we struggled to find a C Team skipper for 2016, Clive stepped into the breach. 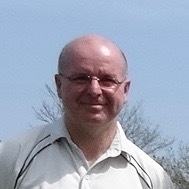 Helped by Duncan Greenslade, Clive ran the C Team mainly as a ‘colts’ side bolstered by a number of senior players and, in the less intense atmosphere of Norfolk League Division 4SW, the Cs flourished, finishing a creditable 3rd. Clive himself played a leading role in that success his wily off-spin earning 18 wickets and placing him top of the bowling averages. This season will present another challenge as the Cs have been moved into 4SE and will face new opposition. When not practising his cricket, Clive is Assistant Director of Mental Health, Learning Disabilities, Offender Health and Substance Misuse at NHS Norfolk and a fervent – but long-suffering – Sunderland fan!